In my last blog post, I talked about future directions for my digital project on early modern charity. I specifically discussed my intention to overlay a diagram showing Venetian parishes in the fifteenth and sixteenth centuries onto my modern-day map of Venice in order to better understand charitable patronage in the city. As I mentioned, I was (and still am!) struggling to find a diagram that can be properly geolocated and that would allow me to accurately track the foundation of charitable institutions in each parish. While I continue to look for other options, my project is developing in different ways. So far, I have explored the data on the foundation of charitable institutions in Venice in a variety of ways—as I have discussed here and here. However, as the title of my project—“Models of Early Modern Charity”—indicates, my interest in charity goes beyond the city of Venice. For the past few weeks, I have been collecting new data in order to add two cities to my project: Lisbon and Seville. As historian C. A. P. Antunes has explained, port cities such as Venice, Seville, and Lisbon “owe their well-known status to the prominent role they played within a broader and more general movement of expansion overseas by the central states they belonged to (in the case of Venice, the city itself). Venetian expansion in the Mediterranean is all in all comparable to the Portuguese and Spanish expansions in the Atlantic and Indian Oceans,” and in all three cities this expansionist activity led to a constant flux of people and goods (Antunes 2010). Figure 1. Lisbon, from Georg Braun and Frans Hogenberg, Civitates Orbis Terrarum (Cologne, 1598), Vol 5. Figure 2. Seville, from Georg Braun and Frans Hogenberg, Civitates Orbis Terrarum (Cologne, 1588), Vol 4. This flux generated many benefits to early modern cities, such as high flow of information, intellectual exchanges, technological developments, not to mention a thriving economy. Yet, there were also negative consequences—i.e. urban overcrowding, unstable labor markets, potential economic crises, etc.—to this scenario that made the population of these hubs at higher risk for poverty and disease. Usually, the more vulnerable section of the population consisted of those without a family framework for support, such as orphans, migrants, single or widowed women, and others (Antunes 2010). 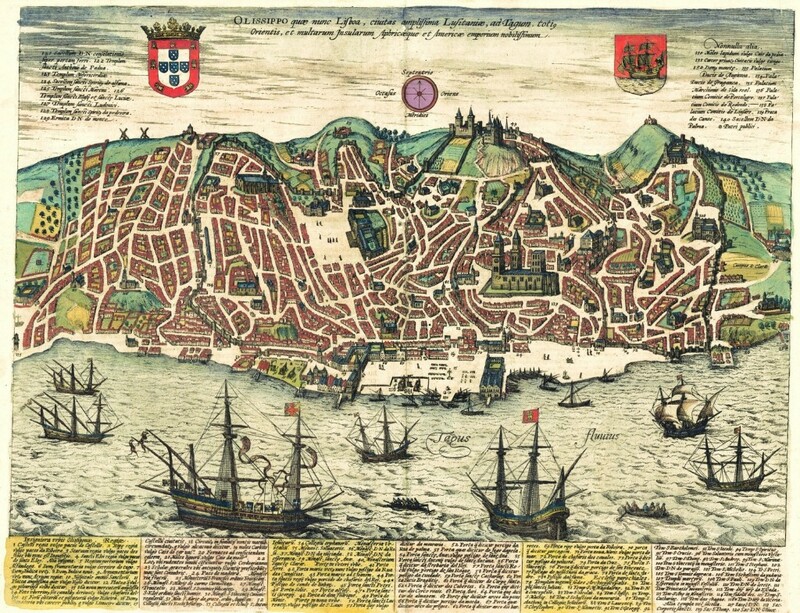 Measures of public health and poor relief in Lisbon, Seville, and Venice were frequent in the fifteenth and sixteenth centuries, and in expanding my study, my goal is to explore each city’s responses to poverty and disease by tracking the foundation of charitable institutions during the early modern period. The data for my initial study of Venice came from Franca Semi’s Gli Ospizi di Venezia (1983), a crucial publication that maps and catalogs the foundation and development of hospitals in Venice. I have yet to find a similar source for Lisbon and Seville. Instead, I am currently compiling data from several sources into an Excel spreadsheet that I can then import into QGIS for mapping and further analysis. Although this lacuna in scholarship creates some challenges, it also shows the potential for a mapping project that includes these two Iberian cities. Stay tuned for future updates!